O'Hara, K. , Nguyen, M-H.C., Haynes, P.
Tracking the evolution of digital technology is no easy task; changes happen so fast that keeping pace presents quite a challenge. This is, nevertheless, the aim of the Digital Enlightenment Yearbook. This book is the third in the series which began in 2012 under the auspices of the Digital Enlightenment Forum. This year, the focus is on the relationship of individuals with their networks, and explores “Social networks and social machines, surveillance and empowerment”. In what is now the well-established tradition of the yearbook, different stakeholders in society and various disciplinary communities (technology, law, philosophy, sociology, economics, policymaking) bring their very different opinions and perspectives to bear on this topic. The book is divided into four parts: the individual as data manager; the individual, society and the market; big data and open data; and new approaches. These are bookended by a Prologue and an Epilogue, which provide illuminating perspectives on the discussions in between. The division of the book is not definitive; it suggests one narrative, but others are clearly possible. 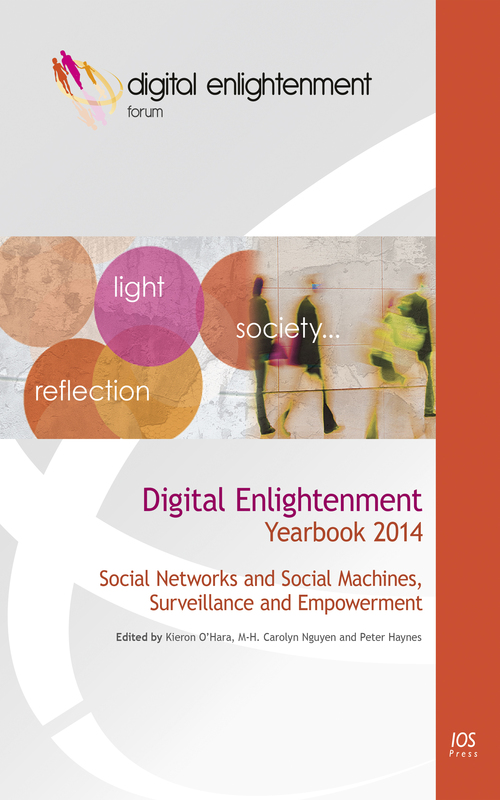 The 2014 Digital Enlightenment Yearbook gathers together the science, social science, law and politics of the digital environment in order to help us reformulate and address the timely and pressing questions which this new environment raises. We are all of us affected by digital technology, and the subjects covered here are consequently of importance to us all.